This is one of the ultimate rarities in all of paper money. It is rare that we can talk about million dollar national bank notes. 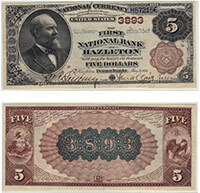 However, a fully intact example of a $500 national bank note should be worth around one million dollars or more based on the condition. Very few banks issued these bank notes. Notes like this that were issued were typically just held for cash on hand requirements and then destroyed. PLEASE contact us if you have one of these trophy items.